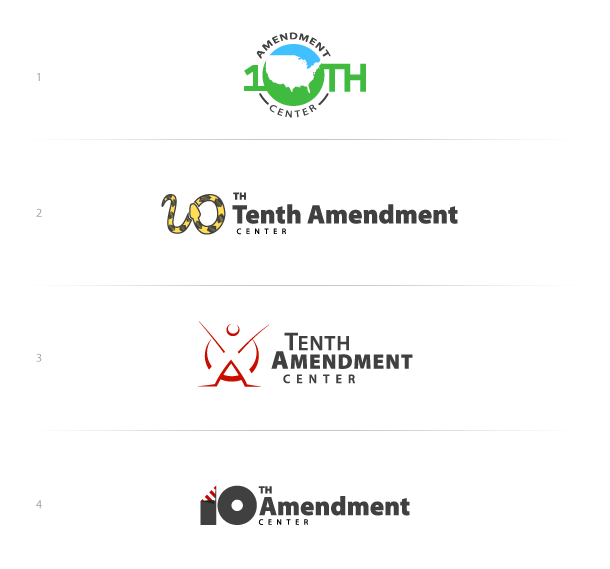 What started out as a small website and blog discussing the proper role of government under the constitution and the nearly continual violations of that document by the Bush administration, has grown over the years to grand central station of a national movement in support of the 10th Amendment. Before starting a project, I have every potential client complete my Logo Design Questionnaire in order for me to evaluate their needs. Below are some of the key details the client provided in the questionnaire. "open to all...don't want to limit based on demographics." What logo designs appeal to you, and why? "clean, modern, possibly abstract. iconic. Would fit well for a nightclub or a graphic designer..."
What logo designs DO NOT appeal to you, and why? "standard, red white and blue, political. ", "The one piece of "instruction" I'd offer - If someone were to look at the final mark, i would not want them to think it was political in nature in any way. Strong and unique, for sure." With this information along with some research and sketching, I worked my way down to the four concepts you see below. Each concept is described below the picture. In this concept I used the "10TH" as the focus of the icon with the remaining text circling the digits. Although the Tenth Amendment deals with States Rights, I decided to place the United States within the "0" to show a certain unity on the subject across the U.S. The green color represents "grass roots" and the blue represents endless room for growth and infinity. For this concept I used a totally different iteration of the snake from the Gadsden Flag also known as the "Don't Tread On Me" flag. The snaked is coiled in a way that provides us with an identifiable "10". The colors for this concept were obvious since the main tie in with the flag is the yellow that was originally used. In this concept I used an "X" to create a "10" and a person reaching out to others or exploding in excitement. The circle in the background represents the sun, "shining light" on the subject. Also in the bottom of the "X" or persons legs, you have the letter "A" for Amendment. The color used in this is generic and any color you like could be used for this icon. This a the most literal concept showing a big bold "10" with a corner of the "1" folding like a US flag, including the red and white stripes. Not a lot of deep meaning behind this except for importance, signified by the boldness of the number. "Thanks again Joshua - I really appreciate the thought that went into the concepts. Oddly enough, I like the simplest one best - #4 - hands down. I can already picture it on all kinds of marketing material...."
The client expressed that the text was almost perfect but he had a request to see the "X" from concept 3 incorporated into the design instead of the "10". "10 - I think an "X" would work best for this. Or, some variation of one in the same bold-type you've used." After tweaking the text a little bit and re-working the fold for the "X", the final mark was pretty much done. There was a little discussion on whether to use the red and white stripes or the yellow from the Gadsden Flag. In the end, the stripes won. The pictures below are final versions of the logo. One in full color, and one monochromatic. "We've got a winner! I like the US version and don't think any changes need to be made to the flag, text, etc. Really nice, clean stuff. thank you!" "Joshua is a pleasure to work with - creative, dedicated, reliable - qualities not often found together in today's marketplace. If you want to work with someone who'll give you the attention you deserve, and communicate with you fully at every step of the process, you'll never go wrong with 1981. And that's not even talking about the creative skills....which are clean, powerful - brilliant..."